There’s a short list of artists whose work is so iconic that it becomes an indelible part of the culture, with enduring images that are familiar even to those who don’t know the artwork’s background. Norman Rockwell is one such artist. His paintings of ordinary life are still celebrated for capturing the spirit of small-town America and illustrating core American values. He’s best known for the cover illustrations he created for The Saturday Evening Post from 1916 to 1963. Born in New York in 1894, Rockwell dedicated himself to his artwork early, leaving high school to study art full-time when he was only 15. His early works appeared in magazines geared for youth, such as Boys’ Life, where he became the art editor at age 19. Rockwell’s long relationship with The Saturday Evening Post was launched in May 1916 with the cover image “Mother’s Day Off.” He created eight cover images for the Post within that first year and went on to paint more than 300 cover images for the magazine. Rockwell was a hugely prolific artist, producing over 4,000 original works during the course of his career. He produced covers and illustrations for many magazines of the time, including Life, the Country Gentleman, and the Literary Digest. His paintings combined meticulous detail and execution with a warmth and charm that lent grace to the everyday subjects he generally portrayed. While critics of the day dismissed his work as overly sentimental, his audiences appreciated the empathy he showed in the way he chose to depict his subjects and the powerful storytelling conveyed in his choice of scenes. The artist also used his stature and popularity to address important issues of his time. For example, inspired by Franklin D. Roosevelt “Four Freedoms” speech, Rockwell created four paintings in 1943: Freedom of Speech, Freedom of Worship, Freedom from Want, and Freedom from Fear. Originally published in The Saturday Evening Post, the images became widely popular, and the paintings themselves were used to boost the war bond effort through a national tour. In the 1960s, he addressed social issues such as racism in paintings like The Problem We All Live With. 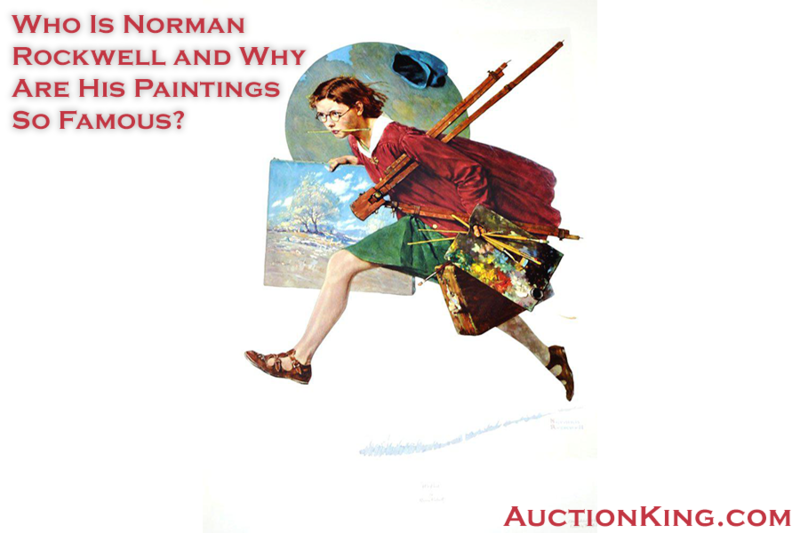 Norman Rockwell passed away in 1978, but the appeal of his artwork has not faded. In 2013 his 1951 painting Saying Grace, which depicts a woman and a young boy bowing their heads in prayer before a meal at a diner while inquisitive youths look on, sold at auction for a record $46 million. Studies (works he created in the process of developing a finished painting) for Triple Self Portrait and Tough Call sold for $1.3 million and $1.6 million respectively in 2017, making it clear that the market for his work is hotter than ever in the 21st century. If you’re looking for fine art at prices you won’t find in a gallery, AuctionKing.com is your source for prints, lithographs, giclees, serigraphs, etchings, and more. With bids starting as low as $1 on authenticated pieces, we give collectors the opportunity to bid and win from the comfort of their own home. To get started, register today for a free online account.